In terms of digital marketing, building your audience matters. You can achieve this by integrating campaigns through social media platforms like Twitter, Facebook, Instagram, LinkedIn and a variety of new platforms, including one we have been enjoying lately - Periscope. Twitter: Craft a brief yet compelling tweet equipped with hashtags and an attractive visual. As the old adage goes, the more attractive the picture, the more attention you’ll get. Pinterest: Create informative content that incorporates images with a tall aspect ratio, detailed descriptions of your event and a call to action to your Periscope stream or landing page. Instagram: consider adding a text overlay to your images. Content descriptions on this channel tend to be shorter (around 100 characters) and include multiple hashtags (try three to five). Facebook: Create a brief video preview to attract attention and tag any guests participating in your Periscope stream to reach a broader audience. Discuss relevant topics: You to have appeal to your audience’s interests, so tailor your content to encourage them to engage with you. Listen to what they’re saying and give good feedback. Show some personality: When responding to your audience, don’t sound like a robot. Liven it up. Show them some personality. It helps humanize your brand and give consumers something to remember. Involve your audience: Think about it like a date - you want a second one right? Well, then make a strong effort to communicate. Ask them questions. Respond to feedback. Acknowledge them. After you finish your Periscope broadcast, you’ll have an opportunity to share the stream for up to 24 hours. You don’t want to lose great content that will disappear after a day. You can reuse that. How you ask? Repurpose it on YouTube. This is a great way to extend the life cycle of great content. 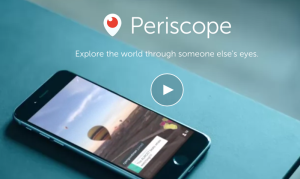 You can find more insights into making Periscope a viable marketing tool here.